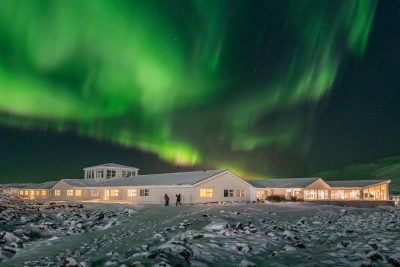 Spending two nights at idyllic Hotel Ranga deep in the spectacular countryside of Southwest Iceland, this escorted short break provides excellent opportunities for seeing the aurora borealis. An expert-guided tour of the Golden Circle’s natural wonders is included, along with a visit to Reykjavik’s old town and the legendary Blue Lagoon. Around an hour's drive from Reykjavik, the friendly, ranch-style Hotel Ranga is in prime aurora country: clear horizons, big skies and no artificial light pollution. An aurora wake-up service ensures you never miss a sighting, while the hotel’s superb observatory has computerised telescopes for incredible night sky viewing. 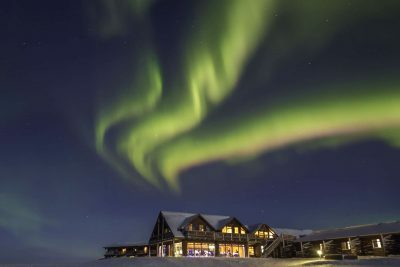 You can also gaze at the cosmos from outdoor hot tubs – or keep an eye on the northern lights through the picture windows of the restaurant while enjoying gourmet meals prepared using fresh local produce. On this exciting short break, you’ll spend a full day exploring the famous Golden Circle with its iconic trio of natural wonders: the twin-tiered waterfall of Gullfoss thundering into an ice-encrusted gorge, Geysir’s seething mud pits and Strokkur fountain geyser and Thingvellir’s fascinating history and plate tectonics. On your third day, a visit to Reykjavik takes in the old town, with its cafés, greens and brightly painted wooden houses. A relaxing dip in the therapeutic, naturally heated waters of the Blue Lagoon is also included, followed by a night at the Northern Light Inn. I don't normally do this, but felt I wanted to say thank you for the excellent service both here and while we were travelling in Iceland. The hotels, our driver and our guide were full of knowledge and couldn't have been more helpful...What a fantastic place Iceland is! These are starting prices in £ per person based on two sharing standard rooms with private facilities, unless otherwise stated. This escorted group requires a minimum of 20 participants in order to operate, and will have a maximum of 29. Find out more about our Northern Lights New Year Special departure. Please contact us for a private departure on any date suitable for you. This itinerary can be tailor made to fit your requirements and group size. Arrive in Keflavik in the late afternoon. The group will then be transferred with their guide to Hotel Ranga for a two night stay on a half board basis (dinner will be a 3 course set menu). Please note that arrangements are usually made for participants to dine as a group. Spend the day exploring the famed Golden Circle route including Thingvellir National Park, where you can walk the rift in between the Eurasian and North American tectonic plates, the spectacular two-tiered waterfall Gullfoss and the spouting geysers of Geysir. Head into Reykjavik and visit the old town and Perlan - a distinctive hilltop building with a viewing platform and revolving restaurant under a glass dome. Continue to the world famous Blue Lagoon for a dip in the warm waters then transfer to the Northern Light Inn for an overnight stay. The guide will leave the group upon arrival at the hotel. The dining options for this evening vary but your guide and the reception staff will be able to make a recommendation should you wish. All dining options for this evening are payable locally. Transfer to Keflavik for the flight back to the UK. If your flight is in the afternoon you may want to book an optional excursion to the volcanic Reykjanes Peninsula (subject to minimum numbers). The scenery on the Reykjanes peninsula is spectacular and dramatic. On this tour you will cross dramatic lava flows and witness steaming vents and bubbling mud pools at Krýsuvík, and will visit the fishing village of Grindavík. Continue further west to the Reykjanesviti lighthouse, see migratory birding cliffs, and walk across a bridge between two continents: at Sandvík, a small footbridge crosses a major fissure between the Eurasian and North American tectonic plates. Please note that this excursion is subject to minimum numbers (6 participants). At the end of the excursion, you will be dropped off at Keflavík airport unless otherwise agreed. Around an hour's drive from Reykjavik, this cosy riverside lodge offers four-star comfort and fine dining in the volcanic heart of rural Iceland.